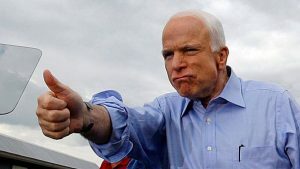 The last act of the traitor Sen John McCain was to give a thumbs down to repealing Obamacare giving the middle finger to every American and costing his party the House of Representatives. Obamacare’s repeal gave the Republicans both the House and the Senate under Obama and they had from then till last Novembers election to remove it. 8yrs and they failed, that’s what cost them the House. They did achieve one thing they removed the mandatory requirement. A gift they didn’t even understand. By removing the mandatory requirement the Law became unconstitutional. A Texas Court has finally ruled it so, and it’s now on a path to the supreme court. The Supreme Court created Obamacare by ruling that due to the mandatory fines it was a tax. Well the mandatory part no longer exists. The Law has been rendered unconstitutional, like it or not it is about to go away. Unlike Obama Trump is not going to “fix it” from the Oval Office. Congress needs to act. That is where we stand. Congress MUST act, no one else can. There are 12.2 million people on Obamacare, there are just as many with preexisting conditions. What is going to happen to these people? Can Congress work together to fix the Problem? The House is held by the Ds and the Senate by the Rs the only way ANYTHING can get done is through bipartisanship. All those who wind up with no coverage thank your local congressman and give a posthumous thanks to Senator McCain for any of your suffering. AS WE’VE BEEN SAYING ..
.. never trust the Tories. The Tory Prime Minister is appealing to a Marxist-Leninist, with terrorist and anti-semitic friends, to keep the UK in the EU. Just let that sink in. The useless Queen won’t do it, so the the DUP and ERG must now bring her, this appalling government and the whole rotten Parliament down. It puts the the parochial concerns of the Little Europeans into perspective, doesn’t it? The world is becoming more wealthy, and trading more, and developing more, at an astonishing rate. And these numbskulls want to keep the drawbridge up against the world. They are stupid, dumb, no-perspective, no-imagination, frightened, backward Luddites. I can’t believe that Creepy Joe Biden, who has been filmed numerous times pawing women (and very young girls), has been accused, by two women, of being a dirty old man. That’s right. “Climate change” protesters, or sexual deviants, perverts and degenerates, as we used to call these loons, have stripped off in the Commons. I thought that patriots might have been up to something when I heard that there was a protest. Then you see the picture and realise it’s the green-haired brigade again. And yet the tone is somehow not lowered. How can anyone possibly lower the tone even further in that place? This evening MPs will again – unconstitutionally , but everyone just accepts that Bercow is corrupt – attempt to overturn the will of the people and keep us in the EU without anyone noticing. Customs unions, single markets, Norway this and that: it all amounts to finally killing any idea that this is a democratic country. Don’t be fooled into thinking otherwise. Here is a sober honest analysis of the Trump Presidency. When you strip away the venom and emotion by both sides it comes down to what has been achieved. Please avail yourselves of other perspectives. No one can complain that it’s just some AM Radio “commentator”. I don’t always listen to Sabbath, but when I do the whole village listens too. This weekend they’ll doing a lot of that. A good weekend to patriots everywhere. As always, share your fav sounds down below, but none of that Euro crap. Like all music soon, that’s verboten. I think a man should be taken at his word and expect to be taken at his word. So I think it’s dishonourable to knowingly betray a promise. Once done, the stain can never be erased. The stench will always linger. That person will always be iffy. I know it sounds old fashioned, in these post-democrat days in this post-democratic land, but a wrong’un is a wrong’un in the eyes of of the honest. We should be leaving the EU today. But because of promise-breaking Remain politicians, it's not happening. We were supposed to leave the EU tonight. The Tories are already putting out the line that Labour voted down Brexit. Labour is irrelevant. Parliament approved the triggering of Article 50, which mandates leaving the EU with or without a withdrawal treaty. The Tories have a majority with the steadfast DUP. It was wholly within the power of the Tory Party and the Tory Prime Minister to leave the EU tonight. They chose to not do so. They chose to renege on multiple promises. They chose dishonour. We’ll leave the EU one day. That cat is out of the bag. It might even happen as soon as 12th April. But never forget that being a Tory is a stain. From tonight, anyone calling himself a Tory should be shunned and excluded. And from tonight onward, for the first time in a thousand years, we know that laws will be imposed by force and not consent. They are not legitimate and have no moral or ethical force. Anyone disobeying EU-imposed laws will have right on their side. National Vietnam War Veterans Day is a commemorative holiday in the United States which recognizes the sacrifices that veterans and their families made during the Vietnam War. It is also a day to give proper recognition to the men and women who returned home from that war and didn’t receive a proper welcome home. It’s a holiday that’s been celebrated since 1973 on either March 29th or March 30th of each year through a patchwork of state resolutions. However, in 2017, the date of the holiday was set as March 29th by U.S President Donald Trump. This day is now officially known as National National Vietnam War Veterans Day.